I survived my night alone without too many sleepless moments. Although I did have a disturbing dream with a giant snake. I woke up around 545 and rolled back over until about 630. I worked some life back into my feet and gave my calves a massage to make the first few steps feel a little less like walking on stilts. Then I wandered back toward the trail to retrieve my foodbag. It survived yet another night. I can’t tell if it’s dumb luck or if I actually know what I’m doing. I decided to eat in my tent rather than deal with having my four-legged roommate from last night trying to steal my food. Having had no signal for the previous days in camp let’s me know just how much of a zombie I am when I do have a signal. No surprise there. I felt sluggish and scrolling the internets put me into an even deeper stupor. I finally starting packing up around 730. I’m only going about 6 miles today and then I’m taking a zero in killington at the mountain meadows lodge. I feel a little guilty about the zero given that Monday I will be off trail for a visit from my steady, but I’m doing it anyway. The weather is supposed to be a soggy mess, and I could use some rest. 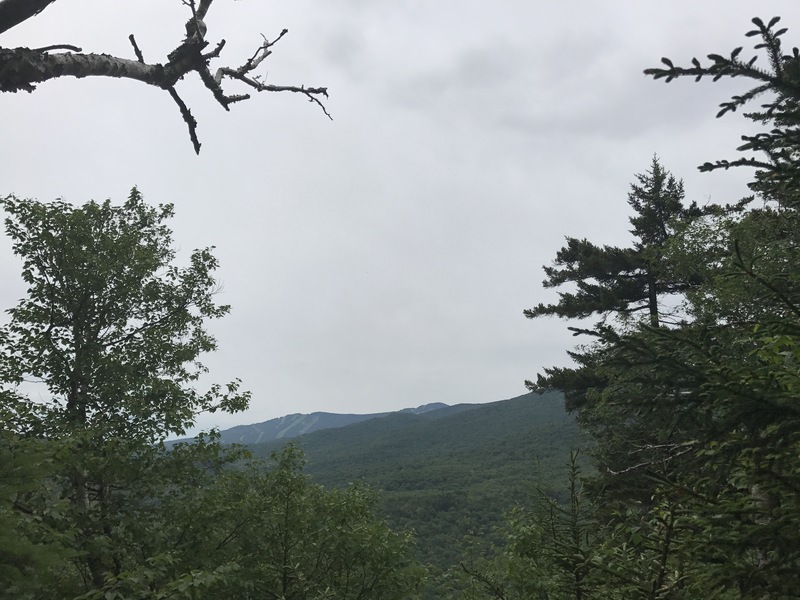 My stay at the green mountain house was good for laundry and food prep, but it didn’t come with a lot of sleep or downtime (some of my own doing). There’s constantly a gap between the hike I feel like I should be doing (ascetic and cheap) and the hike I am actually doing with creature comforts at least once a week. I left a little after 8, and began the descent into Killington. 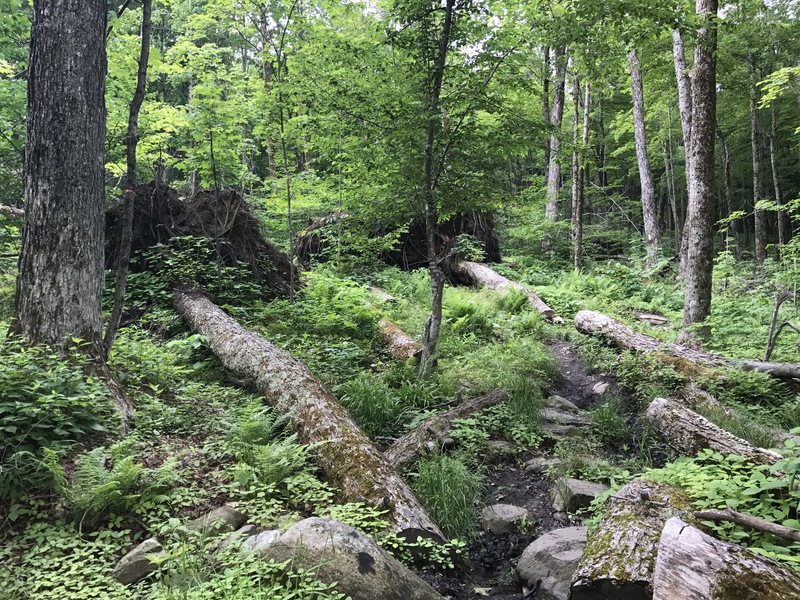 As the trail flattened out, I went through an area with numerous downed trees. Giant root beds tilted to the sky with collections of stones tangled in the network of roots. The trail began to climb again, which I hadn’t expected because I didn’t look closely at the elevation map for today. The humidity made it hard to breathe, and I found myself chuffing my way up the hills. As I walked, I heard industrial noises off to my left. I couldn’t tell if it was road noise or a business. My tolerance for these noises has grown on my thru hike. It’s different than a weekend hike where my goal is to pretend like the mechanical world doesn’t exist, and I only have 4-6 hours to find that peace. I still don’t enjoy it now, but there are many other hours in many other days that could be completely free of man made noises. The stakes are lower. An older gentleman approached heading southbound. He gave a hearty hello and I returned it, asking what all the noises was about because he looked like a local day hiker. He confirmed that it was route 4 traffic. Then he asked whether I had seen some older women along my way. I felt confused at first because I’d been alone since camp. I said no and we passed each other, moving on. Then it occurred to me that he was probably talking about Snow White and fearless, so I called back to him saying oh! Do you mean Paula? (Snow White’s real name). I had accidentally run into their friend with whom they’re taking at least one zero day after they come down from killington. I told him their general location and said I had hiked with them for a couple of days. Then we said goodbye again. I texted fearless to tell her that her friend was on the way. In her reply she said that halfway was determined to catch up to me. This amused and excited me. He took an extra zero day in Manchester Center, so I figured it would be awhile before we ran into each other again. A stream near the trailhead mixed with the road noise to create a wall of sound as I approached the crossing. I saw a woman on the other side of the road walking with a large tan dog on leash and a little gray scruffy thing in her arms. She apparently comes out on her days off to hike the trail when she can. Her dogs were on my heels in a way I thought was cute, but she fussed about them tripping me and pulled ahead to get out of the way. Or was it secretly so she didn’t have to be downwind of me?? Given how she disappeared down the trail, she should have been in front of me to begin with. I tried to get a picture of them, but none of them do the size differential or dog cuteness justice. Then came a troop of children on what I assume was a southbound family trip with a muppet labradoodle leading the way. Someone in the group said “you didn’t know you were going to see a parade today did you? ?” To which I replied, “it’s something different every day.” Then I ran into a southbound woman in her sixties who asked me about my hike. She said my tattoo was the first she’d ever seen that she might want. Then she told me she was out practicing for the last section of the long trail that she’s doing next week with her taller, younger friend. I can relate. When I told her I was on day 66 of my hike, her eyes got wide. 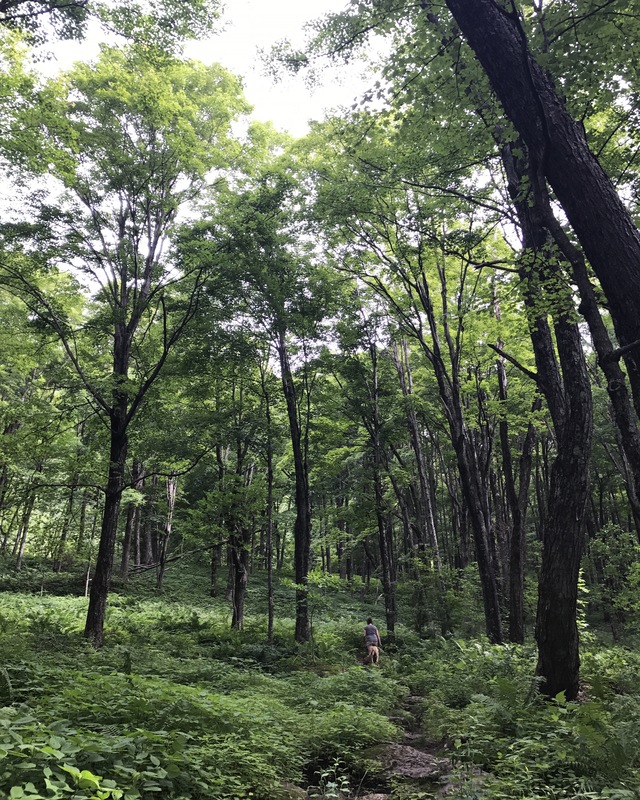 I quickly clarified that I had not started in GA. All of this happened as I made my way through a beautiful open forest that was deceptively steep. Here’s a picture of the woman with the two dogs to give you some perspective of how big it felt. The long trail woman had to take a phone call, so I turned northward. As I walked, gaggle of protesting crows flew overhead, one of them hooting much like a monkey. I found a good rock to take a break around 10am for my first snack of the morning. I sat in silence and thought about whether to get a room tonight or tent on the property of the lodge for much cheaper. I could still hear the chainsaws in the distance, but now that I think about it, I don’t know when they faded away. I made my own mile marker to celebrate 700 miles (top picture). The number baffles me. It’s like when people say some infinitesimal amount of money that doesn’t seem real. A friend wrote on social media “wow that’s a long walk,” and I’m still just under a third of the way through it. She might have intended it as cheeky, but it’s true either way. The descent into killington was unremarkable. While daydreaming about sandwiches and dictating trail notes into my phone, I made a distracted step into the juicy end of a mud flat and nearly submerged my left foot. My heart always sinks when I see water pool over the top of my shoe. Somehow my foot didn’t end up as wet as I expected. I paid closer attention to what I was doing after that. A few minutes later, I heard some awful clanking noise and wondered what was happening when I saw a trail crew up ahead. It was a young group, mostly twenty-somethings from the looks of it. They were working on adding stepping stones. I thought about taking their picture (they’re just as exciting to see as the blaze painters), but I got too overwhelmed by twelve pairs of eyes on me. I thanked them for their work and scurried away with my face burning. The trail led me past Gifford woods state park, which had car camping sites that were big enough to park a bus in. Cadillac sites with picnic tables and fire pits. I considered stopping there to pay $5 to tent, but it was so early in the day and I still had my heart set on a deli sandwich. I guess I could have camped there and still had my sandwich. Pretty sure most of me just couldn’t face the fact that I wanted two nights at the lodge. I pictured route 100 being a smaller road, but it was pretty loud, and made even louder by water on the road with frequent transfer trucks. I felt squeamish about hitchhiking and the distance was short (0.4m), so I hugged the far edge of the wide shoulder and walked to the deli. Thankfully it was gravel and I didn’t have to suffer 15 minutes of pavement. I did manage to scrape my thigh against the bolts on the guardrail. Oops. 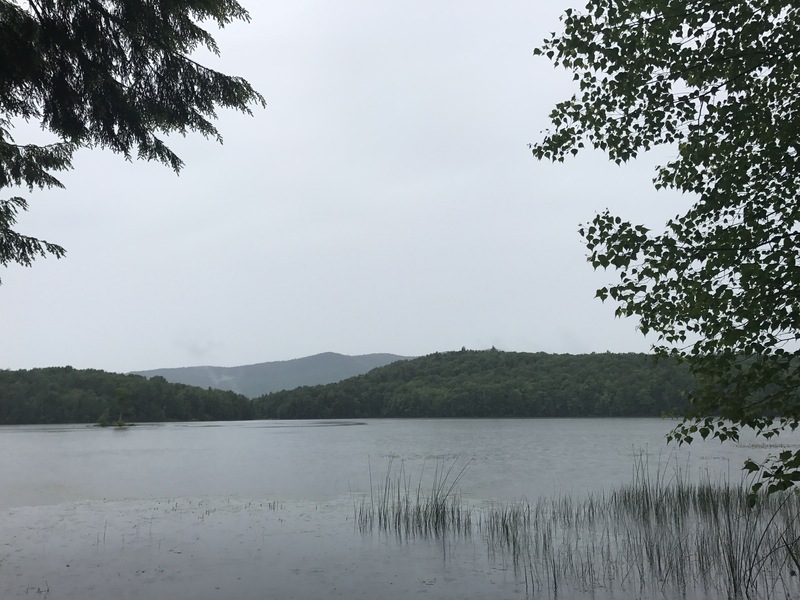 Once I found my way (having skipped about 50 yards of trail that I will not go back to do), I walked .8 of a mile through the rain to the mountain meadows lodge, which sits at the edge of Kent pond. When I arrived, Alex, the innkeeper on duty, gave me my options. Tenting for $10. A “hut” which was actually an old toolshed for $10 or a room for $59. I had been intrigued by the idea of a hut, but I had no desire to sleep in a stuffy wooden shed that seemed ripe for spiders. I told Alex I needed to sit and decide. As I spaced out, I heard alex tell another hiker (cosmo, who made a cameo several days ago when he let me borrow super toxic bug spray), that another guy named halfway was heading in. Halfway! So I told Alex that I wanted to wait for halfway to see if he wanted to split a room. I sat on a couch in their giant, drafty common room and started writing this post. Around 230, I heard halfway’s recognizable hello! to the innkeeper. I hustled out of my chair, not as stiffly as usual because of the lower mileage, and asked halfway about sharing a room. He regretfully declined because he hadn’t had a room to himself since NY. I am not one to deny space, especially to a fellow introvert, so I assured him it was fine. I gave up the tenting ruse and committed myself to paying for two nights. The rooms are the essence of country quaint with the strange camp edition of bunkbeds that look like they came straight of my room in 1989. I’m finishing this post on the bottom bunk because the double felt squishy and too big. I showered and we put on our half load of laundry in the catch-all storage room off the kitchen. This place is mainly a weekend wedding venue and there are no events this weekend, so there are a grand total of 6 hikers staying here tonight (it sleeps 70). It almost feels like we’re in a giant house that we have all to ourselves. Halfway and I ordered pizza and salads from a place around the corner and ate in the common room. We are definitely in a tourist town because the prices were practically New York prices. We did what hikers do while they eat: talked about hiking. Apparently he took the Sherburne pass (aka the “old AT”) trail. 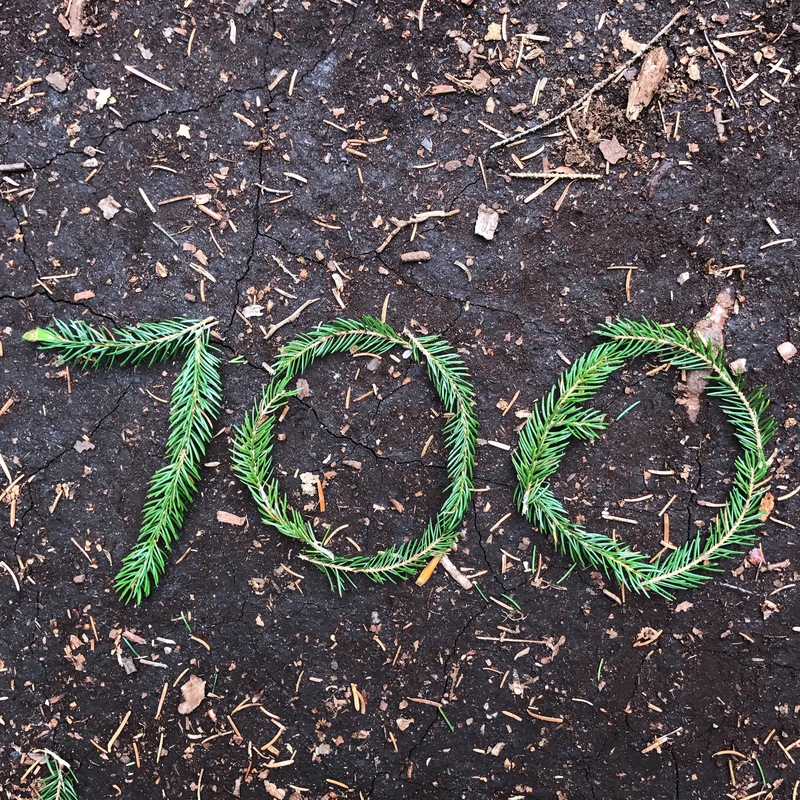 As he hiked, he wondered if he had somehow gotten ahead me because of the detour, but when he stopped to take a break he looked down to find my little “700” written in pine needles. I think it made both of us feel a little bit less alone. Now I’ve had way too much pizza, so I shall edit posts until I fall asleep due to bread coma at like 830. Tomorrow will be planning, more chores and maybe playing pool! Because there’s a pool table. Creature feature: another quiet, drizzly day in the woods. the usual bird suspects are all I can remember. I have a friend with a sheep farm near Killington. I love that area! And since this is a place I have been I can truly picture it…..